^ Origins of Rugby. 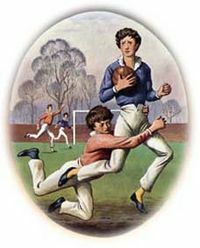 Rugbyfootballhistory.com. [2014-07-15]. ^ 探訪橄欖球運動誕生之地 英國小夥屋頂上敲定規則. M.sports.sina.com.hk. [2014-07-15]. ^ Kemp, Stuart. Rugby World Cup gaining wide popularity. Reuters. 24 August 2007 [30 May 2011]. ^ International Rugby Board – News. Irb.com. [30 May 2011]. （原始内容存档于2010年1月3日）. ^ International rugby board. 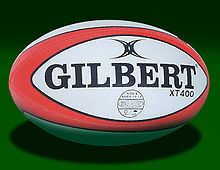 "Rugby ball laws" 22 Feb. 2010. 互联网档案馆的存檔，存档日期2012-07-11. ^ 11.0 11.1 11.2 RLIF. Section 3: The ball (PDF). The International Laws of the Game and Notes on the Laws. Rugby League International Federation: 8. 2004 [30 July 2008]. （原始内容 (PDF)存档于2010-01-05）. ^ Sommerville, D. (1997). The Encyclopedia of Rugby Union. Aurum Press, UK. ISBN 978-1-85410-481-6. Folkard, Claire. Guinness World Records 2003. Bantam Books. 2003. ISBN 9780553586367.